This is Lucinda’s Two Fabric Bargello and she made it at a class at Up North Quilt Shop. The pattern is called “Two Fabric Bargello” and is designed by Susie Weaver. Lucinda asked for light custom quilting and when I loaded the quilt on my machine I still had no idea how to quilt it. My first though was to add one row of feathers to each side of the focus fabric shape and then do a background fill. But once I quilted the feathers I knew that a background fill would take away from the texture of the feathers so I kept feathering rows, alternating their travel direction. I used a teal coloured So Fine thread on the ombre fabric and charcoal So Fine on the focus fabric. Its hard to see the quilting on the focus fabric but I did straight lines with U Turns back and forth to fill that space. I used Quilters Dream Blend batting. I was so happy to see the sun shine yesterday afternoon and the wind had calmed down so I could get some outdoor pictures in the fresh snow. I am now done my quilts for December. In the past I usually took all of December off but this year with the move I decided to keep working to catch up, which I did! I also am taking a few weeks off in January as a good friend is coming to visit from Australia for two weeks so I’m very excited about that visit. So I am now booking into late January and have February wide open so if you need a quilt done just email me to book a spot! I don’t think I have ever had this empty of a booking list but that’s okay as I haven’t even starting advertising I am here yet! Now I get to work on a few of my own projects and quilts for the next few week! 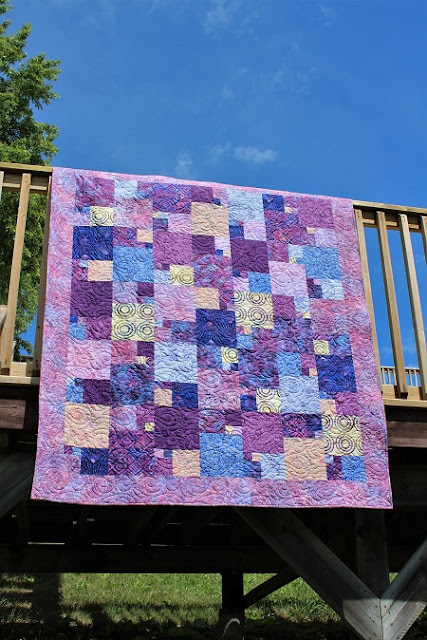 This is Lucinda’s Ripple quilt and the pattern is by Sew Many Creations. She used Zen Chic’s Dandelion fabric from the Fragile collection as her focus fabric and added pretty teals and blue fabrics as accents. She asked for simple quilting so I chose Flirtatious for the panto. I used beige So Fine thread and the batting is Quilters Dream Blend. I found a new spot in my kitchen to photograph smaller quilts as the light from the window is perfect to see the quilting details. It has been very cloudy and windy so getting outdoors pictures has been a real challenge since we moved here. I finished one of my own quilts this month and hope to be able to finished a few more now that I only have a few more clients quilts left for December. This quilt is one I made with a flannel fat quarter bundle using the Oversized Hopscotch pattern by The Quilt Patch. I just loved the colours in this fabric collection and it will be my new cuddle quilt on my couch for the winter. I used Dream Puff for the batting as it is my favourite batting to use with flannel fabrics as it makes them so light and cozy. The thread is a grey So Fine and the panto is called Dazzle. This is Diane’s High Strung quilt and it is a pattern by Jeanne Large and Shelley Wicks ( Quilt Patch). I knew right away I was going to cross hatch the squares and give it that traditional quilted texture. I stitched in the ditch around the applique and stippled the background with Microquilter beige thread. I used green So Fine thread on top and green Bottom Line in the cross hatching. The batting is Quilters Dream Blend. Diane said she was going to add some embellishments to the quilt, like small clothes pins to where the stockings are hung along the ric-rac. This is Patti’s Urban Winter quilt and the pattern is by Sew Kind of Wonderful using the Quick Curve Ruler. Patti had a wonderful story to go along with this quilt as it has a special meaning to her. She was on a Balkan river cruise and she meet a woman from Toronto who knew of a family who did indigo dyeing with dyes that have been used for generations in that Hungarian region. They took a city tram underground and a train from Budapest to a small village and found the shop. Patti bought fat quarters of each design in their hand dyed collection. She carried it all the way through the 7 other countries on their trip on her carry on luggage! I think all of us quilters can related to finding that special fabric that is worth filling our luggage and hauling around until we get home! And what a wonderful reminder of an amazing trip. Now to talk about the quilting! I came up with a few designs and let Patti pick, she liked the simplicity of the feather wreath so we went with that one! I also did a feather motif in the navy curved piece and did loops in the square design. All the elements are stitched on the ditch and I used white So Fine thread on top and white Bottom Line on the back in the white fabrics. In the navy fabrics I used Navy So Fine on top and Navy Bottom Line on the back. I love the texture of the quilting on this quilt at shows up using Quilters Dream Blend batting. I shared this next quilting tip on Instagram and was surprized at how many quilters didn’t know about this trick! If you have a black light on your longarm, all APQS Millenniums have them, you can use it to see Pounce chalk on white fabric! I wanted to use a stencil as a guide for my wreath but didn’t want to using a marking pen, that takes forever! So I used the Pounce, turned on my black light and voila…I can see the white chalk on the fabric. You might notice that the stencil and the finished wreath are quite different, that is because I wanted to quilt open feathers and just used the stencil as a guide, really helps getting those inside feathers even! This week I also made myself a design wall for the studio. I bought 2 – 4x8 sheet of insulation board and covered them each with one twin batt of Dream Poly. I hot glued the edge of the batting to the back of the boards after pinning the batting in place, making sure the batting on the front was nice and smooth. Once the glue was dry I discovered that the two boards fit perfectly in my nook where I just put in my cutting area. Just need to make a few larger bean bags to place on the floor so they don’t slip forward! I tested it out by laying out my Scrappy City Slicker quilt and next thing I know I had the top sewn together! Hope to quilt that one over my Christmas break!